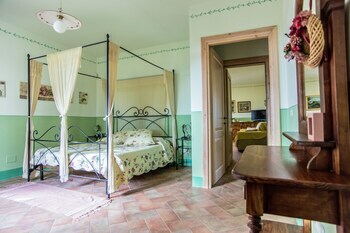 Located in Grosseto, Borgo San Giuliano is within a 15-minute drive of Tino di Moscona and Roselle Archaeological Area. Free self parking is available onsite. With a stay at Mery Sabbiadoro in Lignano Sabbiadoro (Sabbiadoro), you'll be a 4-minute drive from Parco Junior and 6 minutes from Punta Faro Marina. Free self parking is available onsite. With a stay at this apartment in Venice (San Polo), you'll be steps from St. Mary of the Friars and 10 minutes by foot from Rialto Bridge.